The three frameworks Storm, Spark, and Hadoop have their own advantages and each framework has its own application scenarios. Therefore, these three different frameworks should be chosen in different application scenarios. The Storm Framework is the best-streaming computing framework. The storm is written by Java and Clojure. The advantage of Storm is full memory computing, so it stands as a distributed real-time computing system. Stream data processing - Storm can be used to process the incoming and outgoing messages, and then write the results to a certain storage. Distributed RPC - Because Storm's processing components are distributed and have very low processing latency, they can be used as a general purpose distributed RPC framework. Spark is an open source cluster computing system based on memory computing, which aims to analyze data more quickly. Spark is similar to Hadoop MapReduce's general parallel computing framework. Spark's distributed computing based on Map Reduce algorithm has the advantages of Hadoop MapReduce, but different from MapReduce is the intermediate output of the job and the result can be stored in memory, so no longer need to read and write HDFS, so Spark can be better applied to the algorithm of MapReduce that needs iteration such as data mining and machine learning. Application of multiple data sets for multiple operations - Spark is a memory-based iterative computing framework for applications that require multiple operations on specific data sets. The more times you need to repeat the operation, the larger the amount of data you need to read, the greater the benefit, and the smaller the amount of data, but the greater the computationally intensive, the less beneficial. Application of coarse-grained update status - Due to the nature of RDD, Spark does not apply to applications that use asynchronous fine-grained update states, such as Web service storage or incremental Web crawlers and indexes. It is not suitable for the application model of incremental modification. In general, Spark's application is more extensive and more general. Hadoop implements the idea of MapReduce, which computes data to process a large amount of offline data. The data processed by Hadoop must be stored in HDFS or HBase like database, so Hadoop is implemented by mobile computing to improve the efficiency of these data storage machines. Hadoop is suitable for bulk data offline processing is suitable for very low real-time requirements of the scenario. Storm Suitable for real-time streaming data processing, excellent in real-time performance. 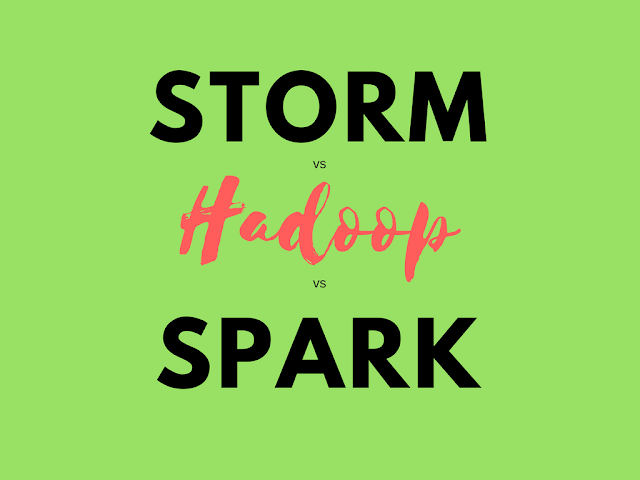 Spark is a memory distributed computing framework and similar to Hadoop's MapReduce batch framework and Storm's stream processing framework. But Spark has done a very good job in batch processing aspect, performance is better than MapReduce, but stream processing is still weaker than Storm, and the product is still improving. Big data is a collection of large data sets that cannot be processed using traditional computing techniques. It is not a single technology or tool, but rather involves many areas of business and technology. Currently, the three major distributed computing systems are Hadoop, Spark, and Storm. One of Hadoop's current big data management standards is used in many current commercial applications. Structured, semi-structured, and even unstructured data sets can be easily integrated. Spark uses in-memory computing. Starting from multiple iterations of batch processing, data is loaded into memory for repeated queries. In addition, various computing paradigms such as data warehouse, stream processing, and graphics computing are combined. Spark is built on HDFS and works well with Hadoop. Its RDD is a big feature. Storm is a distributed real-time computing system for high-speed, large data streams. Added reliable real-time data processing capabilities to Hadoop. Apache Hadoop is an open source framework written in Java that allows distribution of large data sets in a cluster, using a simple programming model. Hadoop framework application engineering provides an environment for distributed storage and computing across computer clusters. Hadoop is designed to scale from a single server to thousands of machines, each providing local computing, and storage. MapReduce is a computing model and software architecture. HDFS (Hadoop File System) is a distributed file storage system of Hadoop. It decomposes large files into multiple blocks, each holding multiple copies. Provides a fault-tolerant mechanism that automatically recovers when a copy is lost or down. By default, each block holds 3 copies, and 64M is 1 block. Map the block to memory by key-value. MapReduce is a programming model that encapsulates details such as parallel computing, fault tolerance, data distribution, and load balancing. The MapReduce implementation begins with mapping the map and operations to each document in the collection, grouping them according to the generated keys, and placing the resulting list of key values into the corresponding keys. Reduce is to simplify the value in the list into a single value, the value is returned, and then the key grouping again, until the list of each key has only one value. The advantage of this is that after the task is decomposed, parallel computing can be performed by a large number of machines, reducing the time of the entire operation. The MapReduce program is implemented in three phases, the mapping phase, the shuffle phase, and the reduction phase. The job of a map or mapper is to process input data. The general input data is in the form of a file or directory and is stored in Hadoop file system (HDFS). The input file is passed to the line by the line mapper function. The mapper processes the data and creates several small pieces of data. This phase is a combination of the Shuffle phase and the Reduce phase. The job of the reducer is to process the data from the mapper. After processing, it produces a new set of outputs that will be stored in HDFS. Hive is a data warehouse tool based on Hadoop. It can map structured data files into a database table and provide complete SQL query function. It can convert SQL statements into MapReduce tasks. This set of SQL is referred to as HQL. Make it easy for users unfamiliar with mapreduce to query, summarize, and analyze data using SQL language. Mapreduce developers can use the mapper and reducer they write to support Hive for more complex data analysis. As you can see from the above figure, hadoop and mapreduce are the foundation of the hive architecture. The Hive architecture includes the following components: CLI (command line interface), JDBC/ODBC, Thrift Server, WEB GUI, metastore, and Driver (Compiler, Optimizer, and Executor). The author Kiran Gutha has an experience of more than 6 years of corporate experience in various technology platforms such as Big Data, AWS, Data Science, Artificial Intelligence, Machine Learning, Blockchain, Python, SQL, JAVA, Oracle, Digital Marketing etc. He is a technology nerd and loves contributing to various open platforms through blogging. He is currently in association with a leading professional training provider, Mindmajix Technologies INC. and strives to provide knowledge to aspirants and professionals through personal blogs, research, and innovative ideas. You can reach him at: Linkedin or Email.